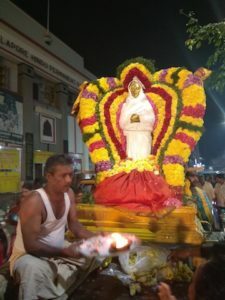 On the occasion of Thai Poosam, the deity of Ramalinga Vallalar at Mundagakanni Amman Temple, Mylapore was taken in procession around the Mada streets on Jan 21 evening. The day is also celebrated in honour of Vallalar. This entry was posted on Tuesday, January 22nd, 2019 and is filed under Religious. You can follow any responses to this entry through the RSS 2.0 feed. You can skip to the end and leave a response. Pinging is currently not allowed.